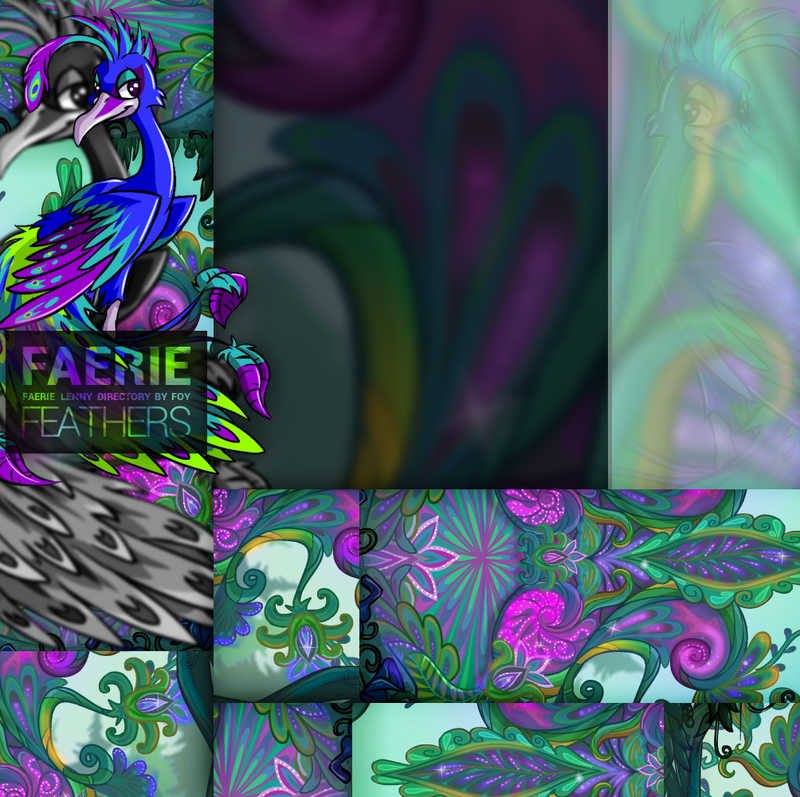 Hello everyone, and welcome to Faerie Feathers. 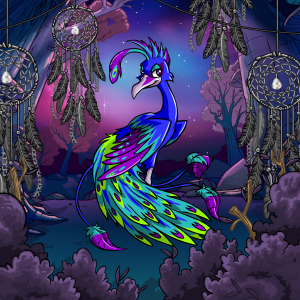 This is a pet directory site for the beautiful Faerie Lennies hosted and run by Foy on 21/07/15, to go with her love for all things Faerie Lenny. 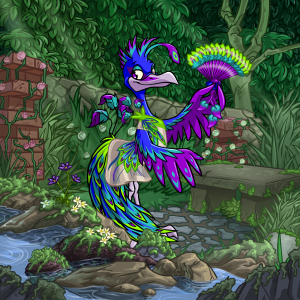 There are a few ways to get Faerie Lennies, you can either create a lenny, and paint it with a Faerie Paint Brush at the Rainbow Pool, you can morph any pet using the Faerie Lenny Morphing Potion, you can zap with the Secret Laboratory Ray, or even get a special quest from the elusive Fountain Faerie, and take a dip in her pool. 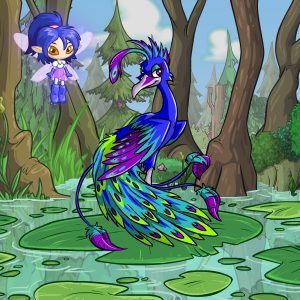 However you got your beautiful Faerie, they're all welcome here, where you can show them off in all their glory. 20 Lennies listed so far! All Lennies will be listed in alphabetical order. Page updates happen anywhere from one to three days, so please be patient. It's highly recommended, but not required, that your pet owns a customization/outfit before submitting the form. But if you still don't see your Lenny after a week, send me another neomail. Story: Casanthe studied the supernatural alongside his half-mad scientist father since he was a fledgling. So it's no shock to Cas when his recently deceased best friend Thelos appears to him as a moody haunt, demanding that Cas help him pass to the next world. Cas wants to help, but doing so means using a dangerous pocket watch that Cas's father made that allows time travel. But little does Cas know that each time he uses it, he takes one step closer to his own grave. And maybe that's exactly what Thelos wants. Story: Traded a royal custom for her the day after pets were being autoconverted years ago. It was between her and an UC Grey Uni. Still looking for that Grey Uni, but never regretted it. She's really a piece of art! Story: Cesn is the lady of the family, loving all things pretty. 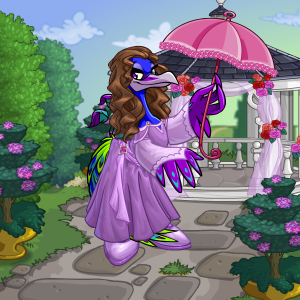 She will never go anywhere without her parasol and likes to have it on hand. Her favourite things are, not surprisingly, shopping and tea parties, and spends all her time dressing up. Rough and tumble is the last thing on her mind, and hates fighting. She wont admit this to anyone, but she is also terrified of her brother Paecoc, and him dressing up in dark and gothic styles always sends shivers down her spine. 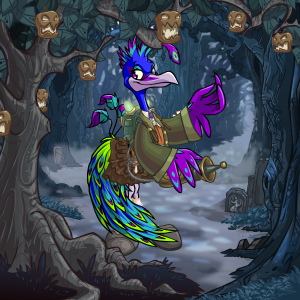 Story: I created her and she was quickly made into a Chokato Chia, they are very cute but after a year or so a friend gifted me a potion and paint brush for my birthday and Chokalota the faerie lenny was created. Story:Always has her head in books, she loves reading about mysteries and adventures, much to the hatred of her sister Cesn, who wants her to be girly and come shopping with her. 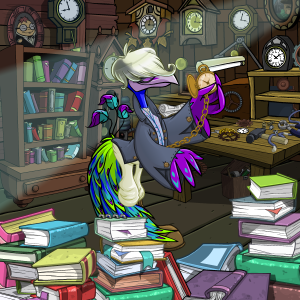 Never seen without a book, she researches past historical events and is always on the look out for rare artifacts. She considers herself a collector of objects, though so far she hasn't found anything to collect, apart from books, fictional and otherwise lining the shelves of her room. Story: Lover of ghosts and ghouls, Curyf and her Dogglefox Geoffrey are on the case to get rid of your haunted hijynx. With her trusty ghoul catcher she can disintegrate the ghosts into energy, which she then puts into jars and experiments on. No one knows exactly why she does this, but she doesn't care for feelings and problems. She wants to explore how ghosts come to be, and how their energy can be manipulated. A little weird as Cesn says, but she enjoys it. Story: Exilidor is a know it all, says so himself. He likes to know everything about everyone. Always listening to conversations, overhearing other peoples stories and jokes and claiming them for himself. He's not a very trustworthy lenny, and spends most of his time making enemies, rather than friends. 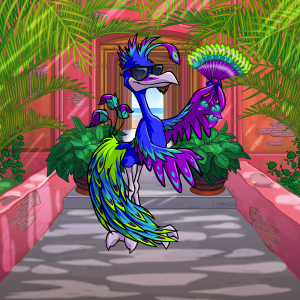 He likes to know everything about Neopia, and steals some of Clovers books from time to time, just to learn more. Besides, she has a whole roomful of them, she wont notice if he takes one...or ten. Story: Genevieve is bookish and logical. There is no puzzle she cannot solve. She is a bit shy, but a fiercely loyal friend! 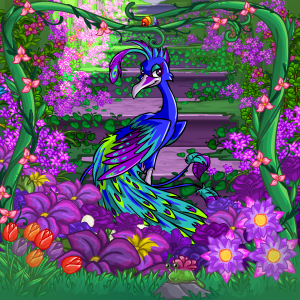 Story: Iuhn was just recently transformed from a basic Jubjub to a beautiful Faerie Lenny after an accidental run-in with a Lenny MP and a clumsy trip into the the Rainbow Fountain as he was still getting used to his longer legs. He tells me he's currently trying to "discover himself" and refuses to leave his lovely resort with lots of sunshine and beaches..
Story: Macedonius is a Faerie Lenny warrior, know for been gracious even throught he belongs to the Brute Squad. 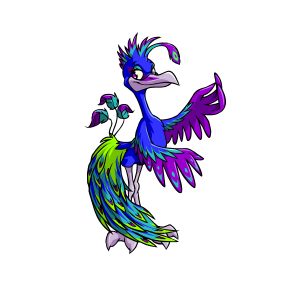 He was hired by the King Araquistain to protect the Egg of Life hidden at Pastelite's orphanage. 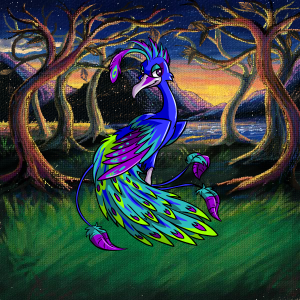 Story: Maveiz is the eldest of the flock, and as he likes to say himself, the wisest. He stops their arguing and bickering and tends to get angry at the slightest thing. He'd prefer nothing more than sitting in his flower garden, with a nice cup of tea, listening to his favourite music. However running a house full of faerie lennies is no easy task, and they tend to get worked up over the slightest problem. One thing they all have in common, is they respect Maveiz, who hates the responsibility, but someone has to do it. Story: A lenny of poor descent, her life has been nothing but bad luck from a very young age. Forced to marry off to a wealthy household, before managing to escape and join Maveiz and his group of lennies. Until they had a falling out, Maveiz was too overbearing, too protective. So she left, and started fending for herself, and the few lennies that joined her. She runs a company...that could be classed as a private investigator. Finding anything, from juicy gossip from rivals, to terrible secrets from friends. She'll keep them safe, for a price. Story: Remikk likes peace a quiet. 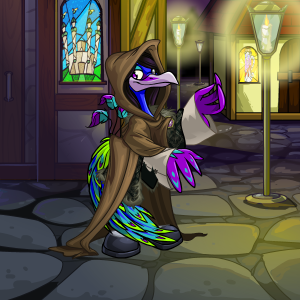 Once an explorer travelling the seas of Neopia, he turned to a life of peace and tranquility after his ship capsized, and he out of all his crew, was the only one remaining. 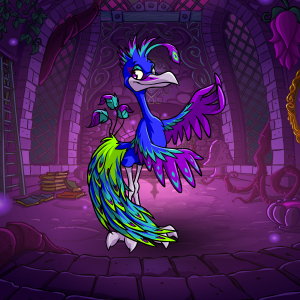 He found Maveiz in a small inn just outside Neopia, and they struck up a conversation. Maveiz could offer him sanctuary, and protection, which Remikk sorely needed at the time. So he took him up on the offer. He guards the temple dedicated to Spirits, letting them pass in peace. He dislikes Curyf and how she handles spirits, experimenting on the dead was nothing to be proud of. But was he any better losing all those lives, all those years ago? Story: Always, she'd looked to the sky, wishing for one moment that she could fly. But her wings were always bound. How had this happened to her? The cruelness of those jealous of her unreachable beauty. She'd never been bad to them, oh no. She'd been kind, everyone loved her. And yet they were still so jealous. She was the perfect pet. 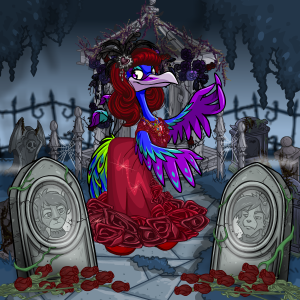 She had everything...riches, those gorgeous looks, and she gave rides to the little ones who didn't crush her feathers. And so they punished her for it. And every night and every day, she stares at the clouds, wishing she could spread her wings and take to the sky. Her heart yearns, strains, against the bounds. The fiery anguish in her didn't go unnoticed. And one day, as her tormentors jeered at her helplessness, the bonds broke. How had it happened? they wondered, their mouths gawking. No one really knew, not even Sky. But she was free, and that was all that mattered. 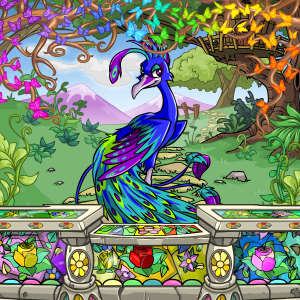 She stretched out those long, colorful wings out again, took one last glance behind her, and with a small smile, not filled with hate, she took to the air, never going back again. Story: Not much is known about Tuiro, landing outside Maveiz's door many years ago. He keeps quiet, and forever loyal to Maveiz, always helping him out with things. Though he doesn't talk much, he has a soft spot for Cesn, and on his free time can usually be found sitting with her, listening to her gossip, or tell him about her latest item. So much mystery, one thing is for sure, he's no push over. Story: Her love of cooking is second to none. Always trying out new recipies and ideas. She loves baking, and inventing new dishes for the rest of her family to try. Nothing beats when she is in her kitchen, happily cooking. Though she does have her own garden as well, where she grows all her own vegetables. 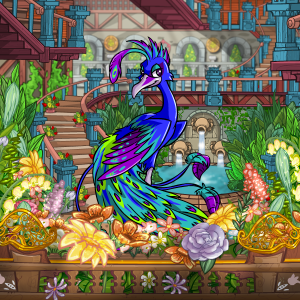 Cesn likes to help believe it or not, tending to her flowers in the nearby plot.